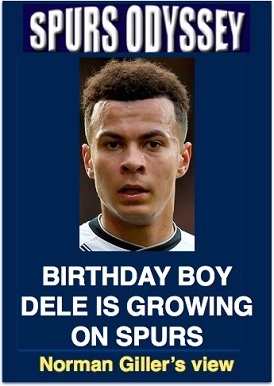 Just dwell on this fact: Dele Alli will be 22 on Wednesday. Twenty-two. The burden this young man has to carry every time he runs on to a football pitch is ridiculous. Okay, much of the booing and barracking he gets has been brought on by his occasionally poorly judged topples to the ground when barely touched. But this is something he has learned from his elders, and all the signs are that he is now playing the game in the right spirit, the Spurs spirit. The boy is still 21. Were you in total command of everything around you when you were his age? He is still growing up and could develop into one of the finest young players we have ever produced on these shores, provided he is given the right encouragement. It sickens me to hear him being ridiculed by ignorant football fans. Just take Stoke on Saturday. When his name was announced he was booed, every time he touched the ball he was jeered. This is the treatment he gets everywhere he plays. He is still 21, for goodness sake, and could run rings round all those crucifying him for no reason at all. For several weeks the know-nowt couch coaches had been writing him off, but his mature performances against Chelsea and Stoke have silenced many of his critics. I have rarely seen a player show so much composure in the penalty area as when he laid on man-of-the-match Christian Eriksen�s goal on Saturday. He waited, waited and waited before releasing the ball to the Danish prince, who had the simple task of steering it into the net. Most players would have got rid of the ball quicker than a Moscow post-marked parcel. But soon-to-be-birthday-boy Dele had the maturity, the sense and the confidence to pick his pass with aplomb. It was not so much an assist as a silver platter service. Our Spurs Odyssey guru Paul H. Smith brings us a full report of a workmanlike victory, including his view that Harry Kane did not get a touch for the second goal. Meantime, early birthday greetings to you, Dele. Keep being your own man. The ball and the world is at your feet. Ignore the ignorant critics, most of whom could not kick their way out of a rice pudding. So, that�s the first two fences cleared in Tottenham�s Grand National of an April. But now the obstacles get bigger and more formidable, with two Manchester mountains to scale and a Brighton banana skin to avoid. First come champions elect Manchester City at Wembley on Saturday evening. Their fantastic season is suddenly being interrupted by hiccups � trailing 3-0 in the Champions League quarter-final to Liverpool and going down 2-3 to deadly rivals Man United after leading 2-0 at the Etihad on Saturday. If � I did say if � they beat Spurs on Saturday and West Brom defeat United on Sunday the title is officially theirs. A Tottenham victory will delay the coronation and further cement their place in the top four and guaranteed Champions� League action at our regal new home next season. It will be interesting to see which City arrives at Wembley. They could be psychologically flat if Liverpool remove them from the Champions League in tomorrow�s second leg. Or, if they survive, they could be really flying. Then tomorrow week it�s off to the South Coast for what looks an easy match on paper against Brighton, but it could prove difficult on the pitch. Chris Hughton will be using all the tactical nous learned on the playing fields of Tottenham to sink his old club. Next, arguably the most important game in years: the FA Cup semi-final joust with Man United from the �away� dressing-room at Wembley. Seven successive FA Cup semi-final defeats have wrecked Tottenham confidence, and we will all be looking to Pochettino to pick a full-strength team for what is a huge game that could put an April spring in our step � with 22-year-old Dele Alli leading the march. WEEK 34 of the Sports Odyssey Quiz League 2017-18. The rules are simple: I ask one Tottenham-related question for which a right answer earns you two points, and then a related teaser that can bring you an extra point. Who was born in Ystrad and won 34 international caps during 12 years with Spurs? Which number shirt did he usually wear in 240 League and cup appearances for Tottenham? Please email your answers by Friday�s midnight deadline to: soql34@normangillerbooks.com. Question 33 was: Which Spurs player was born in 1992, has won 36 international caps and was an Olympic silver medallist? What number Tottenham shirt does he wear? Most of you were spot on with Lucas Moura, who wears the No 27 shirt and in the early glimpses we�ve had of him looks a Brazilian box of tricks. There are now more than 50 of you jostling for first place as the dreaded tie breaker approaches! First name drawn from the correct answers: Jim Hughes, a 20-year Spurs fan from Reading who found our quiz on Google. I will send Jim a screen version of my Spurs �67 book (I have now sold all copies, and the book raised �4,000 for the Tottenham Tribute Trust to help our old heroes Thank you all those Spurs Odyssey followers who gave their support).